Day Four of our Spring Fling Releases at Power Poppy! Hasn’t it been fun? I think today’s sets just might be my favourite, but when it’s this good how do you choose a favourite right? But today we bring you Peony Muse and Artful Display. I’ll start off with Peony Muse because I’m just a little bit infatuated with it! Oh this gorgeous set will be a staple for you if you love big bold flowers! What I really love about the direction of a lot of the sets Marcy has given us this month is that they are very “buildable”. Meaning, you can take different parts of the sets and contruct your own arrangements, going different directions every time. This one is gorgeous! I really love the soft look of watercolor paired with white embossing that is very popular right now with a lot of card makers. I began by drawing out on paper what I thought I might like for an arrangement, stamping it on scrap paper in ink just to see if it would work, and then pulling out my watercolor paper, some Eclipse masking tape, White Craft Ink and embossing powder, and building this gorgeous arrangement. What’s really cool is that once it’s all stamped, the colouring is actually really easy because you’re only colouring those areas without detail lines. It’s also helpful that I had stamped the image in ink on scrap paper first, because with the white embossing on watercolour paper, sometimes you need a bit of a guide to refer to so you know what you’re colouring. 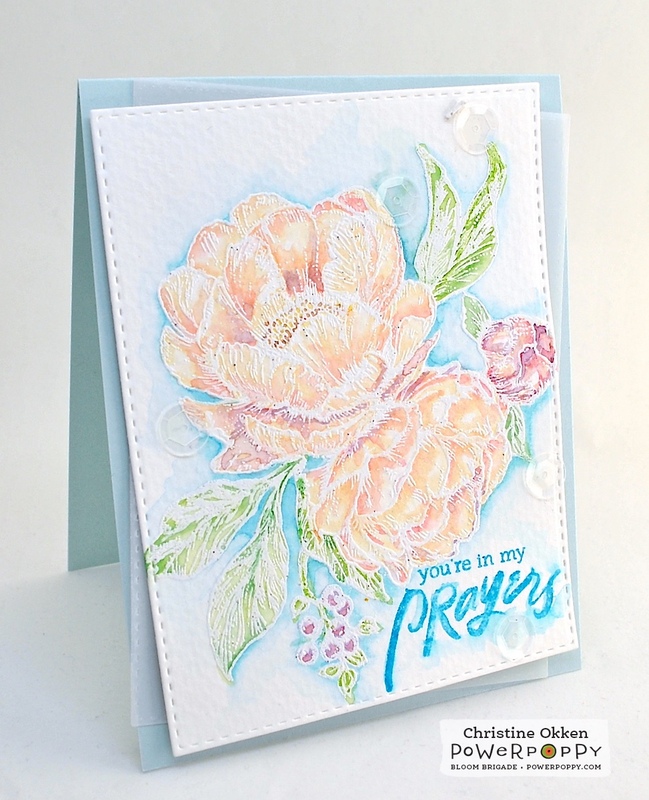 I used some Letraset Aqua Markers for this one, giving the peonies some soft coral and rosey tones. I kept everything very simple here, a little vellum behind the focal layer, the beautiful handlettered (by Marcy) sentiment washed in slightly to mimic the watercolouring and then some clear sequins for a bit of reflective shine. Now for something completely different! Hold onto your hats for Artful Display! Marcy has given us something so unique in this set, there is nothing like it that I’ve seen in the stamping community. 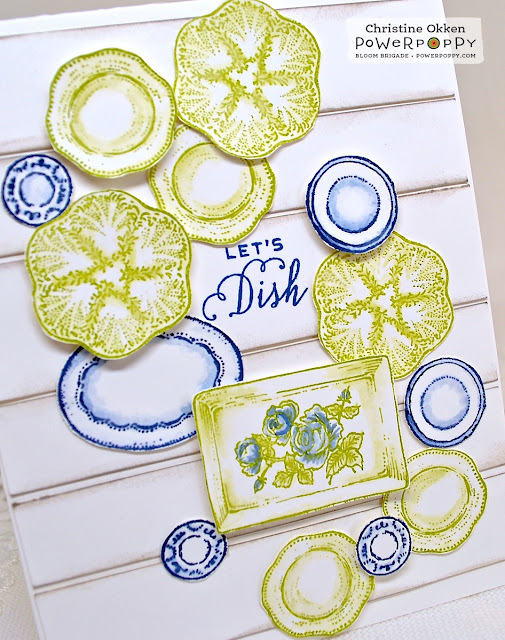 It showcases groupings of decorative objects that you can play with to create "room scenes" with dishes, platters, and even a vintage Oyster plate. The Staffordshire Dog figurine and bouquet of Ranunculus can be used with or without the plates. These little displays are making a big comeback in decorating, and Marcy thought it was perfect timing to finally bring this set to life! 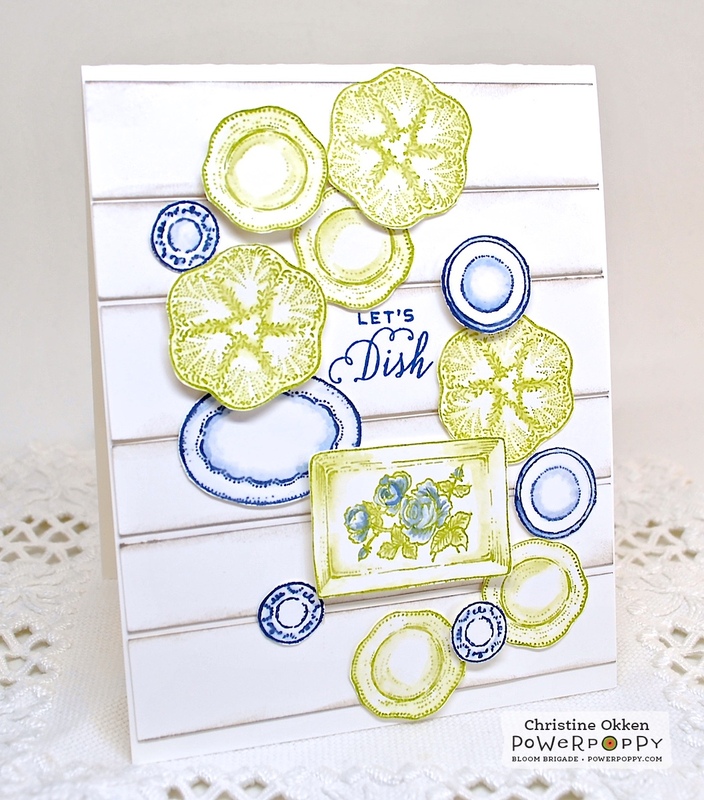 Marcy gave us the wise advice to go to Pinterest and look up "Decorative Plate Displays” to inspire us, there are so many creative ideas out there! For this design I’m pairing some of the inspiration I found on Pinterest for plate displays, and my love of Joanna Gaines from Fixer Upper, calling this one “Plates on Shiplap”! It was SO fun to put together. I actually started with the plates, stamping many of them several times in Navy and bright green ink onto regular card stock, then I took my waterbrush to the plates to soften the lines and watercolor the edges a bit. I cut out each little plate and arranged it on my desk in a way I thought looked fun. I took a little picture with my phone of the arrangement so I’d have something to refer back to. I really like the plate displays that have a bit of a clustered off center look to them. Next I took strips of white card stock 4 1/4 x 1, to 4 1/4 x 1 1/2 and sponged up the edges a bit with Distress ink in Pumice Stone. Those are adhered to the card base like shiplap on a wall, and then plate by plate is added to the design. Much like the plate displays, they’re tucked into each other and some are popped up. It was a really easy card to put together once I had the design in my head. A cute little sentiment finishes it off. Pretty awesome set don’t you think? The gang’s all here and playing along again, you’ll find amazing inspiration again from these talented ladies today! The white embossing and soft coloring is gorgeous! 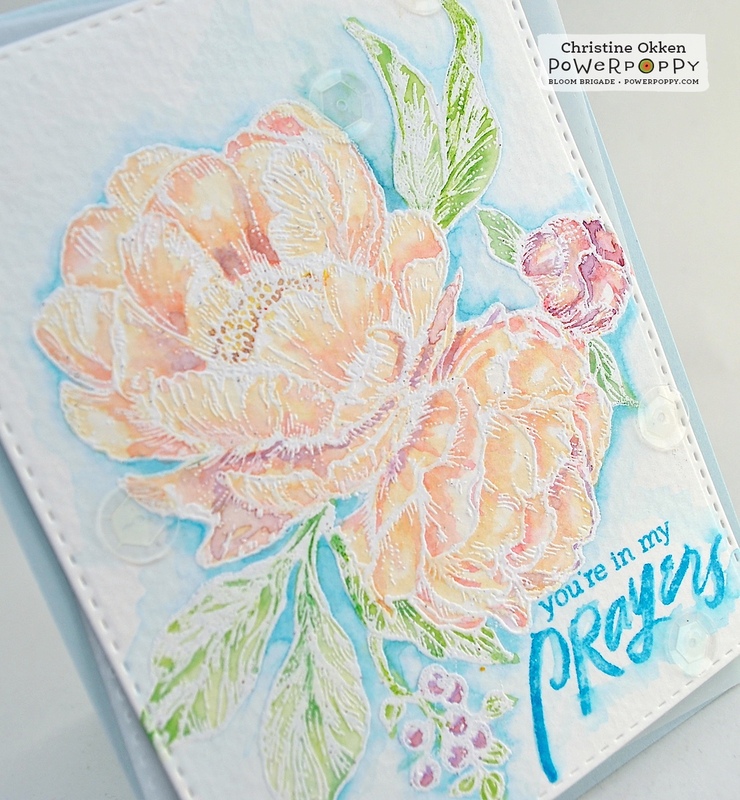 Simply gorgeous peony card Christine. Your dishes look wonderful, arranged perfectly and just so pretty. YOu rocked that set girl! such lovely arranging of the flowers, the coral colors are just beautiful and so soft! Oh, my, Christine! The watercoloring on white embossing is absolutely dreamy. You have a knack for dreamy. And the plates on shiplap are so cute! What a brilliant idea!